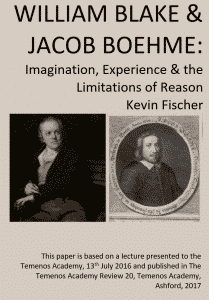 William Blake & Jacob Boehme: Imagination, Experience & the Limitations of Reason by Kevin Fischer. This essay examines how Jacob Boehme and William Blake understood and valued imagination, and how imagination is quite distinct from fantasy. Both men saw it as rooted in living experience, and as such necessary for a fuller knowledge and understanding of reality. For both, abstract reasoning alone gives only a partial view, one that can distort and limit our understanding and the world that we do experience. By contrast, the creative embodied imagination places us more fully in existence, in ourselves and in the world; it makes possible true Reason; it reveals all the profound potential that is too often unexplored and unrealised in us; and by doing so it affords us a vital living understanding of and relationship with the Divine. Thanks to Kevin Fischer for letting us post his work here.